New Directions Publishing Corporation, 9780811218917, 96pp. Spring and All is a manifesto of the imagination -- a hybrid of alternating sections of prose and free verse that coalesce in dramatic, energetic, and beautifully cryptic statements of how language re-creates the world. 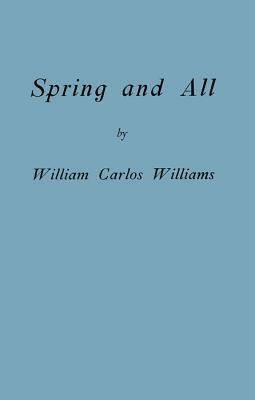 Spring and All contains some of Williams's best-known poetry, including Section I, which opens, "By the road to the contagious hospital," and Section XXII, where Williams penned his most famous poem, "The Red Wheelbarrow." Now, almost 90 years since its first publiction, New Directions publishes this facsimile of the original 1923 Contact Press edition, featuring a new introduction by C. D. Wright.